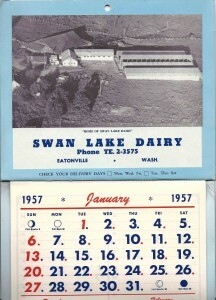 Bought this 1957 calendar off eBay. 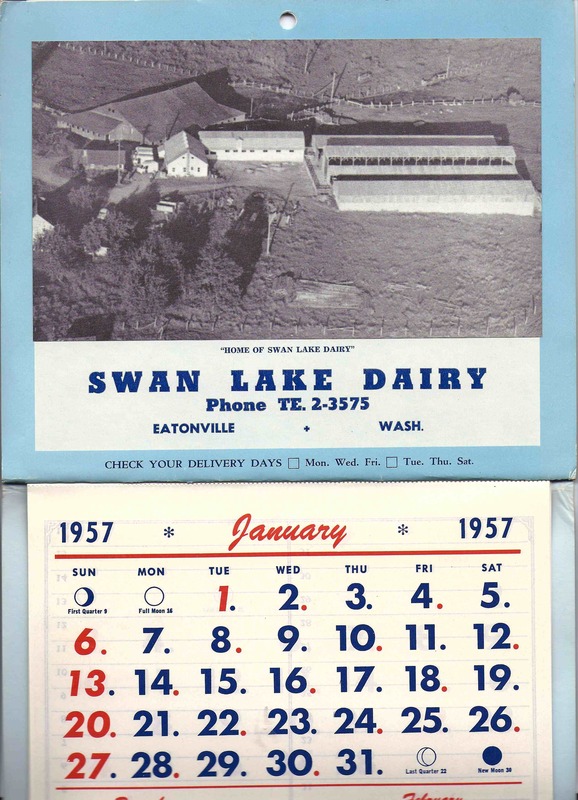 Had to get it, since it’s Ogie Enwall’s Swan Lake Dairy (no longer in operation) that was up the road, behind the Ohop Grange. The farm was built on Robert Fiander’s homestead claim filed back in 1871. My folks (Louie and Kathy Mettler) tell me that Ogie had a strong Danish accent and was tough to understand. But when he spoke, it was important and well thought out, and you needed to listen. Ogie’s daughter Evelyn writes a fabulous piece about the dairy and her family that appears in Diane Grant’s book, Cruiser. “80 acres was the central partof the farm that my parents bought from Chris and Hannah (Fiander) Leber and William Leber. There is some disagreement among us about the number of acres. I believe we started with 160 and ended with 240. Our parents added pieces, purchasing some from George Bittner and the farm once owned by the Kregor family. “Yaww, dis iss Ogeeee, I got annudder flata tyer, I bringa da truck inna, Okayya..” this was many a phone calls I would get while working at my Dads Dodge dealership and gas station back in the ’60’s. Ogie had a fleet of old Dodge delivery vans that were running on some very bald tires. and we were always fixing his flat tires. Ogie was a real character. One of those kind of guys that you never forget. Eatonville was full of those kind of “Norman Rockwell” kind of characters !! I hated fixing those split-ring wheel flat tires from Ogies SwanLake Dairy trucks back then,but the memories are are priceless today. . Thank you Diane for buying this calender. I’m so glad I sent the ebay listing to you. Yeah, my and dad thought he was great guy. Although they never dealt with flat tires. 🙂 They finally brought the price down on the calendar too. 🙂 Thanks. My sister and I laughed so hard at your description of our Dad’s speech. Somehow people understood him sooner or later. I will keep my eye out for bottles. Those would be great. I am Clara (Fiander) “Gram” Jensen’s great grand-daughter. Mae Ladine “Chick” (Duffy) McConnell is my Mom. I have a Swan Lake Dairy delivery box for bottles (wood and metal) would you and your sister like to have it? Just email me personally @ hendersonj_k@msn.com and we’ll figure it out how I can get it to you. I live in Federal Way. My cousin is John Carney of Eatonville, of course. Thanks for showing this. My father was from Denmark, not Norway. I see a spelling error! Rats. The boards were sawn; not swan! I enjoy this site. Greetings to all. Oops. Sorry for the errors. I’ll make the changes first thing into the morning! I too have a wood and metal crate that’s says, Swan Lake DY 54 on it. If any one is interested. It is in prefect condition. Really neat piece of history. That is SO great. Picture to share?